“Let’s go,” all three leaders said as they sat alongside each other to sign multiple copies of the deal. They then shuffled binders around in front of them, to finalize the deal that remakes one of the world’s largest free trade zones. When the signing was over, they paused for a photo-op. “Might as well hold that up,” Trump said, displaying the fresh signatures as the three leaders sat together. Despite that and other prodding, Trudeau opted not to follow his peers in holding up his binder to celebrate — a sign, perhaps, of the lingering effects of the contentious process that was triggered when Trump imposed tariffs on Mexico and Canada earlier this year, which remain in place. The signing event and the leaders’ remarks were livestreamed. You can watch the event here. In the lead-up to the signing, Canadian officials had “made it clear they didn’t want to celebrate the end of a year of U.S. attempts to twist Canada’s arm with the tariffs still in place,” the CBC reports. But that wish ran counter to the desires of Trump and Peña Nieto, both of whom have preferred to portray the deal as a victory that helps to cement their legacies. The USMCA (read the whole text here) replaces the North American Free Trade Agreement, which had created a free trade zone between the three countries back in 1994. The deal will require ratification by all three countries’ legislatures before taking effect. The USMCA deal emerged in early October, months after President Trump hit Mexico and Canada with tariffs on their steel and aluminum products. That move set off retaliatory tariffs and intense negotiations to create a new trade pact. When it was his turn to speak, Peña Nieto said the trade agreement includes provisions for e-commerce and informational technology — subjects that he said made it necessary to update NAFTA. “In fact, one-third of the agreement includes topics that were not included in the first agreement,” he said. Among those provisions, he said, are protections for workers’ rights and the environment, and elements that seek to extend the benefits of free trade more broadly. The signing took place on Peña Nieto’s final day in office; Mexico’s newly elected president, Andrés Manuel López Obrador, will be sworn in on Saturday. Shortly before the signing ceremony, Peña Nieto awarded presidential senior adviser and Trump son-in-law Jared Kushner with the Order of the Aztec Eagle, the highest honor Mexico gives to foreigners. The move “shocked many in Mexico,” as NPR’s Carrie Kahn reported earlier this week, referring to the outrage and anger that has poured out online. Later in the G-20 meetings, Trump will turn to another high-profile trade crisis, when he has dinner on Saturday with Chinese President Xi Jinping. If the current trade tensions between the United States and its major trade partners, especially China, escalate into a full-blown trade war, what should developing countries do? Before discussing the results, some comments on the modeling choices are in order. First, the simulated, high (nearly 30 percent) tariffs by the U.S. are consistent with the tariffs imposed since the beginning of this year on aluminum, steel, and other imports from China. These tariffs rates are, in turn, similar to the “Column 2 tariffs” currently applied to Cuba and North Korea. We assume the U.S. imposes Column 2 tariffs on all countries. The retaliation by the major trading partners is, however, restricted to imports from the U.S. This creates opportunities for developing countries to export products that were previously imported from the U.S. Second, the option of developing countries’ signing regional trade agreements with non-U.S. states stems from the fact that there has been a proliferation of such agreements since 2017, including among G-20 countries, the Comprehensive and Progressive Agreement for Trans-Pacific Partnership (CPTPP), and the African Continental Free Trade Area (CFTA). Finally, the multi-country, multi-sector general-equilibrium model captures only the static gains and losses from the trade war and developing country responses. It does not take into account the effects of a trade war on investment (through increased uncertainty) and hence on long-term growth. Also, since most developing countries are small, open economies, we assume that there is no retaliation from their actions. In terms of the results for the four options for developing countries, the worst is to join the trade war. The higher tariffs will make it harder for these countries to export and recoup the terms of trade losses from the trade war. Relative to the “no-war” scenario, developing countries will suffer a GDP loss of 0.2 percent and export loss of 0.3 percent by joining the trade war (see Figure 1). These costs are double what they would face by doing nothing. By contrast, if they sign regional trading arrangements with all countries outside the U.S., developing countries could reap significant benefits and mitigate the costs of the trade war: GDP could rise by 0.4 percent and exports by 1.7 percent relative to the no-war situation. If they were to in addition unilaterally eliminate tariffs on imports from the U.S., i.e., turn the other cheek, these gains would be even higher, especially for Latin American and Caribbean countries that are closely linked to U.S. markets. The latter two options enable developing countries to take advantage of the market opportunities created by the reduction of exports from the U.S. to its major trading partners. While these results emerge from one model, they represent a direction for policy that is likely to be robust, at least qualitatively, to further refinements and other modeling frameworks. The point is that trade wars between large countries create openings for non-warring countries to increase exports to the combatants. The best policy response is to take advantage of those opportunities. Needless to say, “turning the other cheek” may not always be politically acceptable. In fact, there may be strong political pressure to retaliate and raise tariffs against the United States, say. The paper shows that yielding to such pressure has costs, both directly and in terms of forgone opportunities to reap the benefits from a cooperative strategy. NAFTA 2.0 must not go to Congress unless further improvements are made to stop job outsourcing, raise wages, protect the environment and remove special protections for Big Pharma to raise medicine prices. Our job is to make those changes happen: the first step is to watch this webinar and get up to speed. The Association for Accessible Medicines (AAM), together with 28 groups representing patients, taxpayers, workers and health care groups, submitted letters. They were sent to U.S. Trade Representative Robert E. Lighthizer, Health and Human Services Secretary Alex M. Azar and congressional leadership expressing concern that the U.S. Mexico-Canada Agreement (USMCA), if left in its current form, will keep drug prices high and out of reach of Americans. The letter states that the draft agreement contains provisions that are inconsistent with U.S. law and includes monopoly protections and deterrents to competition that will slow the development of more affordable biosimilar medicines, hurt generic drug competition and disrupt the critical balance between access and medical innovation in the health care market. Co-signers include AFL-CIO, AARP, Kaiser Permanente, American College of Physicians, American Federation of Teachers, FreedomWorks, Patients for Affordable Drugs and SEIU. “We look forward to working with the Administration and Congress to foster a free, fair and balanced trade agreement with Mexico and Canada that ensures an adequate balance between access to affordable medicines and support for pharmaceutical innovation,” says AAM President and CEO Chip Davis. The letter is available at MedsForAmerica.org at http://bit.ly/USTR-USMCA-letter. The MedsforAmerica.org website provides patients with an opportunity to contact their members of Congress to encourage more prescription drug competition in USMCA to bring down high prices. Labor provisions in the U.S.-Mexico-Canada Agreement, while an improvement over the original NAFTA, are unlikely to make a “meaningful difference” for North American workers, the AFL-CIO said last week. The labor group, in pre-hearing comments submitted to the U.S. International Trade Commission, said the new deal’s lack of “labor-specific monitoring or enforcement provisions (such as an independent secretariat or certification requirements)” were of concern to the largest federation of unions in the U.S. The AFL-CIO reiterated that it had yet to take a final position on USMCA and added that it would welcome some changes. The International Brotherhood of Teamsters, meanwhile, was much more sanguine about the new deal.“We conclude that the new NAFTA is a better deal for American workers and our members than the original NAFTA,” the group wrote in Oct. 30 comments. “However, we must withhold our support until the Commission has published its analysis pursuant to Fast Track and until the administration presents the 116th Congress with implementing legislation that fulfills the promise of the progress made at the negotiating table on our priority issues, especially the protection of workers’ rights under the Labor Chapter,” the Teamsters added. The group also took aim at provisions included the labor annex and urged the ITC to be skeptical that the language could “effectively promote changes” to Mexico’s laws and practices. “The USITC should not assume that the mere presence of such obligations will effectively promote changes to law and practice,” the submission states. “Although the incoming Mexican president has signaled strong support for labor reform, Mexico has not yet enacted the legal changes required, much less put them into practice. The labor union also addressed language crafted to fix what led to the first and only U.S. loss in a labor dispute settlement case filed under a free trade agreement. The May 10 Agreement — struck between congressional Democrats and the Bush administration in 2007 — has been used as a foundation for labor chapters in free trade agreements. It says FTA parties must show that a labor violation occurred because of a “sustained or recurring course of action or inaction” and in a “manner affecting trade or investment between the parties.” The USMCA includes footnotes clarifying the definitions of those pillars, as Inside U.S. Trade reported in April. But the AFL-CIO says the text “retains objectionable limitations” outlining the ways in which a violation must occur under an FTA, though it believes the clarifying footnotes are a step in the right direction. “While the text retains the objectionable limitations that labor violations under the agreement must be in a ‘manner affecting trade or investment’ (which likely excludes much of the public sector) and occur in a ‘sustained or recurring course of action or inaction’ (which excludes egregious but one-time acts such as murder or torture), the footnotes clarifying these standards are welcome improvements,” the submission states. The chapter includes review mechanisms including “mechanisms to conduct retrospective reviews of its regulations in order to determine whether modification or repeal is appropriate,” according to USMCA. Public comments and hearings beginning on Nov. 15 will be used to inform an ITC study on the economic impact of the USMCA, which is due within 105 days of the president’s signing of the deal. “New NAFTA”: New red tape for regulators? Understanding the regulatory practices and cooperation provisions of “New NAFTA” and what they could mean for food safety, worker and environmental protections in the United States and Canada. Watch the recording of the “New NAFTA”: New red tape for regulators? webinar with Sharon Treat of the Institute for Agriculture and Trade Policy (IATP) and Stuart Trew of the Canadian Centre for Policy Alternative. 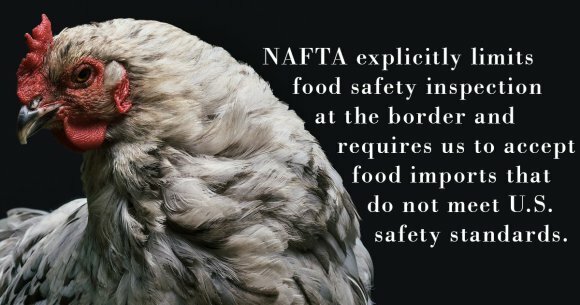 Several chapters in the USMCA (United States-Mexico-Canada Agreement), or “New NAFTA,” create new hurdles for governments and regulators trying to protect people, animals and the environment from harmful food products and practices, while creating additional opportunities for lobbyists to shape regulations at the outset. In this IATP webinar, Sharon Treat, Senior Attorney at the Institute for Agriculture and Trade Policy, and Stuart Trew, Senior Editor of The Monitor at the Canadian Centre for Policy Alternatives, pinpoint these provisions of the “New NAFTA”—in the Good Regulatory Practices and Technical Barriers to Trade chapters and their sectoral annexes—and urge food and environmental activists to work together to resist this expansion of the corporate trade agenda. In addition to watching the replay, check out the presentations, additional resources recommended by the presenters and submit a comment to the Regulatory Cooperation Council (RCC) by December 10, 2018. Submit comments to the Regulatory Cooperation Council (RCC) by December 10 for the Federal Registrar Notice. The Office of Information and Regulatory Affairs (OIRA), part of the Office of Management and Budget, is seeking public input on how the US federal government “may reduce or eliminate unnecessary regulatory differences between the United States and Canada.” This request for information relates to the future activities of the US-Canada Regulatory Cooperation Council (RCC), which was discussed in the IATP webinar. The OIRA has specifically requested proposals to “modify or repeal existing agency requirements to increase efficiency related to economic activity” and “reduce or eliminate unnecessary or unjustified regulatory burdens, or simplify regulatory compliance while continuing to meet agency missions and statutory requirements.” The federal register notes, however, that the RCC is a way to fulfill deregulatory goals of the Trump administration including the Executive Order calling for repealing 2 regulations for every one that is adopted. This is an opportunity to make sure that the record resulting from this consultation includes submissions from civil society supporting high standards and harmonization upwards to the most protective standards, and not just industry submissions supporting deregulation and the lowest common denominator. Farmers started forming co-ops nearly a century ago, primarily to get better prices for their crops. They pooled their resources, put up storage bins and gained leverage with buyers Harvest Public Media’s Amy Mayer explored the growing role of co-ops in rural development. “Cooperatives were created to provide a marketing outlet for producers in an era when they generally didn’t have a lot of options in marketing their grain,” said Keri Jacobs, an agricultural economist at Iowa State University. But co-ops, no matter their size or focus, must share profits with the members who own and run them. That’s helped make the country’s 2,000 or so agricultural co-ops a driving force in rural economies, creating jobs and filling community coffers with property taxes. Ag co-ops compete head-to-head with the biggest private grain buyers including Cargill and ADM. Plus, they’re much more than just the place where farmers buy seeds and sell grain; many offer a wide range of services. “They now take care of a host of activities that a farmer used to do on their own,” said Johnathan Hladik of the Center for Rural Affairs in Lyons, Nebraska. Those activities include spraying pesticides, applying fertilizer and custom harvesting. “And these cooperatives employ a lot of people,” he added. Iowa’s 49 grain co-ops employ 8,000 people across 650 locations, according to David Holm of the Iowa Institute for Cooperatives. Hladik noted that some employees work seasonally while operating their own farms and others have year-round, full-time co-op jobs. Even though co-ops offer a variety of services throughout the year, harvest remains a busy time. Persistent rain in Central Iowa delayed the harvest this year, but on a clear, windy October day, trucks were lined up to empty grain into the pit at Key Cooperative in Roland. When a driver positioned a semi over the pit, Steve Webb cranked open the hopper so freshly harvested soybeans could flow down, landing on a conveyor that would move them into one of the large storage silos. Key Cooperative member Branon Osmundson farms a bit north of this elevator and said selling to the co-op potentially means getting money back. That’s because co-ops invest their profits back in the business and then use a dividend-like system called patronage to return some amount to members. There are also potential tax benefits to selling to a co-op. After Congress shook up the tax code late last year, it briefly looked like co-ops could be big, if inadvertent, winners. Osmundson said membership applications suddenly flooded in from farmers who already sold to Key. “And you’d see some of the names and you’d be like, ‘I would have just assumed they were a member because they’ve been doing business here so long,’” Osmundson said. Congress further amended the tax law to adjust its impact on co-ops and other grain elevators, fixing the so-called “grain glitch.” So while the tax implications of selling to a co-op are pretty similar to before, some farm businesses may benefit from selling to a private elevator that offers a slightly higher price than a co-op. Osmundson said he’s sticking with the co-op and he expects many other farmers will, too. Co-ops are everywhere: Think credit unions, many local grocery stores and some retirement communities. Members make important decisions, such as how or whether to expand the business or when to buyout a competitor. In some rural communities, the ag co-op is the largest employer and the biggest property taxpayer. A co-op that updates or replaces an antiquated elevator can rejuvenate the economy. Helland said Heartland has built new elevators in other small communities or bought-out private ones when a company that answers to distant shareholders no longer wanted to invest in the location. Helland said the board makes decisions about what seeds to sell, which additional services or products to offer and how to best serve the greatest number of members. But Heartland is also committed to investing in infrastructure that more broadly supports rural communities. “The bottom line is, we’ve spent millions and millions of dollars in rural areas,” he said. And beyond agriculture, co-ops are having a moment in the United States and abroad. Jacobs, the economist, went to a meeting about cooperatives in the Netherlands this summer. She said she heard a theory that as people have less trust in things like traditional markets, government or large businesses, they turn to what’s closer to home. Co-op membership can help people feel more empowered and less vulnerable. 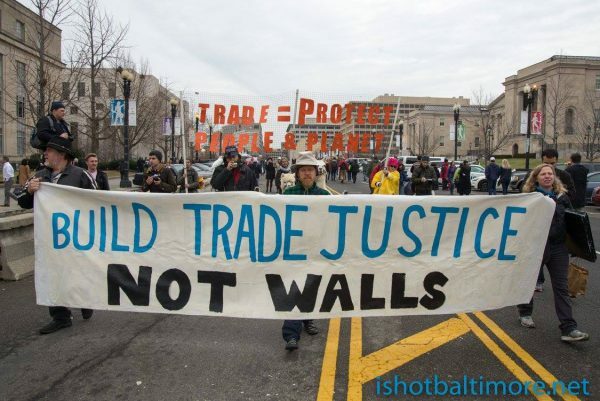 Since the Clinton era, when the North American Free Trade Agreement (NAFTA) was created, global trade has been written by and for big corporations at the expense of people’s health, worker’s rights and the environment. Trump Trade – through the renegotiation of NAFTA – continues that approach. Trump is claiming a political victory merely by reaching an agreement, but it is not a victory for people or planet, as will be described below. Trump Trade should be rejected. If we are to achieve a new model of trade that protects the environment, workers and democracy, we need to demonstrate that rigged corporate trade will be rejected every time it is brought forward. The time to organize to stop this agreement is now. 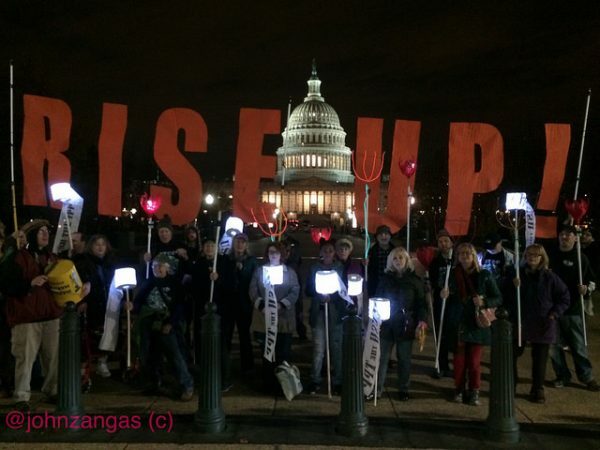 Trump withdrew from the Trans Pacific Partnership (TPP) because a mass social movement made it unacceptable and it could not pass in Congress. Some of the provisions in the TPP are included in the USMCA. Like the TPP, the USMCA contains polluter-friendly non-binding terms on the environment, e.g., the text “recognizes that air pollution is a serious threat to public health,” but includes no single binding rule to reduce air pollution. 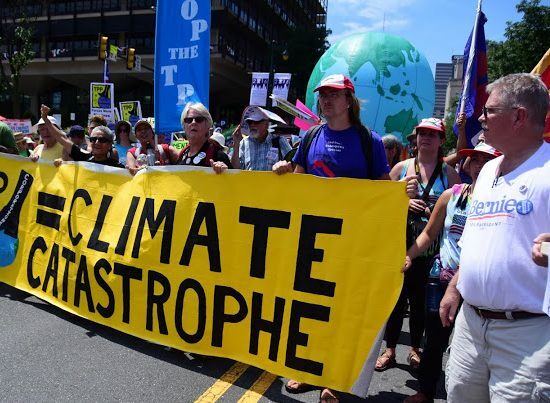 The Sierra Club reports the USMCA takes a significant step backward from environmental protections included in the last four trade deals by failing to reinforce a standard set of seven Multilateral Environmental Agreements that protect everything from wetlands to sea turtles. The absence of environmental enforcement continues the failed corporate trade of the Clinton-Obama eras. Trade agreements could be designed to reduce greenhouse gas emissions, but climate change is not even mentioned in the USMCA. Greenhouse gas emissions will increase. The Sierra Club reports the deal’s lack of binding environmental standards allows corporations to evade US environmental laws by shifting jobs and toxic pollution to Mexico where environmental policies are weaker. It reinforces the US’ status as the world’s largest outsourcer of climate pollution. Some keys to preventing greenhouse gas emissions are ‘Buy American’ and ‘Buy Local’ laws that provide incentives for locally-produced goods. The USMCA negates those laws, requiring that industries based in Canada and Mexico be given equal access to US government contracts. The USMCA exempts oil and gas corporations that have, or may have, government contracts for offshore drilling, fracking, oil and gas pipelines, refineries, or other polluting activities from reforms to Investor State Dispute Settlement (ISDS) provisions. These intensely polluting corporations would be allowed to challenge environmental protections in rigged corporate trade tribunals. Trump Trade preserves a NAFTA rule that prevents the US government from determining whether gas exports to Mexico are in the public interest. This creates an automatic gas export guarantee, which will increase fracking, expand cross-border gas pipelines, and increase dependency on Mexican climate-polluting gas. The USMCA gives corporations extra opportunities to challenge proposed regulations before they are final, and to repeal existing regulations. This makes it harder to put in place environmental regulations or rollback the pro-polluting regulations of the Trump era. USMCA does not require Country Of Origin Labeling (COOL), nor dolphin-safe labeling and makes GMO labeling more difficult. It uses the requirement that food labels reflect ‘sound science’ to prevent accurate labeling. USMCA serves Monsanto and other giant agro-chemical corporations by allowing unregulated GMOs, rolling back Mexico’s regulation of GMOs, and letting chemical giants like Monsanto and Dow keep data on the safety of their pesticides secret for 10 years. USMCA is designed for agribusiness, not family farmers and consumers. Like the TPP, the USMCA increases the cost of pharmaceutical drugs through intellectual property protections that go “significantly beyond” NAFTA. USMCA gives pharmaceutical companies at minimum 10 years of market exclusivity for biologic drugs and protects US-based drug companies from generic competition, driving up the price of medicine at home and abroad. A major area of concern has been ISDS, trade tribunals where corporations can sue governments if new laws or regulations undermine their profits. 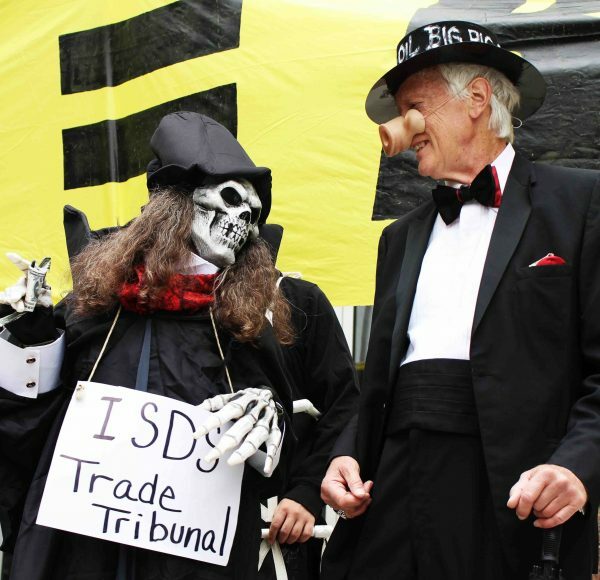 ISDS empowers corporations to attack environmental and health laws in trade tribunals made up of three corporate lawyers and receive monetary judgments worth billions from tax dollars. The USMCA reduces but does not eliminate the unjustifiable and indefensible ISDS settlement mechanism, which privileges foreign investors over communities regarding access to justice. After three years, ISDS would be eliminated with Canada and dramatically scaled back with Mexico with some unacceptable exceptions. After that, US and Canadian investors would use domestic courts or administrative bodies to settle investment disputes with another government. Are there workarounds to this ISDS reform that protect investors, e.g. will domestic courts seize assets within their country to repay investors, as a US court did for a Canadian mining company this year? Regarding Mexico, the new process is designed to protect oil and gas industry investors from the privatization of Mexico’s oil and gas sector. Global Trade Watch writes, “several additional sectors were added, including railways and infrastructure. . . followed by an open-ended list, which could provide problematic flexibility for investors to argue that their investments qualify.” In other words, what looks like ISDS reform contains a giant loophole for corporations to continue to sue governments. Under NAFTA, corporations can receive exorbitant awards for “expected lost profits.” Under USMCA, investors can only be compensated for losses that they can prove on the “basis of satisfactory evidence and that is not inherently speculative.” How this is interpreted is up to the courts. They urge incoming President Obrador to see this as part of the “mafia of power” that he ran against. They describe how Trump pressured the weakest negotiator, Mexico, with the right wing Peña Nieto administration, and used that to threaten Canada with exclusion and 25% tariffs if they did not agree. There is still time to stop USMCA. Leaders are expected to sign the deal on December 1 at the G-20 meeting. Then President Trump has 60 days to report to Congress on changes to US law that are required by the agreement. Within 105 days of the agreement being signed, the US International Trade Commission (ITC) must complete a study of the agreement’s economic impact. Congress will have to pass legislation to implement USMCA. After Congress receives the final bill from the president, it has 90 days of being in session to act on it under Fast Track rules. It is unlikely that all this can be accomplished before the 2019 legislative session. Now that we know more about the contents of the new NAFTA, we need to mobilize to stop its ratification and implementation by Congress. 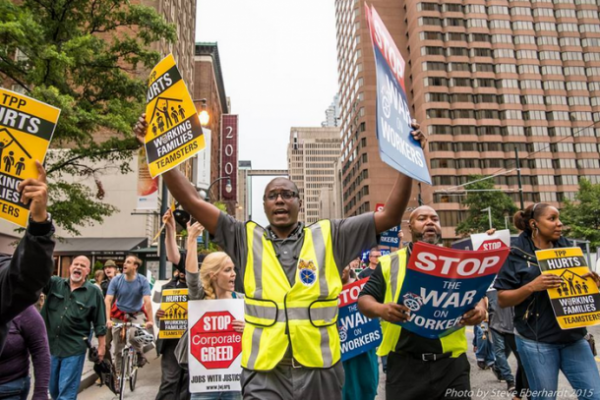 If we are to win a new model of trade that raises the bar on protection of workers, the environment and democracy, we must show, as we did with the TPP, that rigged corporate trade will be stopped by a popular movement. Sign up at TradeforPeopleandPlanet.org to stay informed. After over a year of negotiations over the North American Free Trade Agreement (NAFTA), the United States, Canada, and Mexico finally reached an agreement about the future of trade within North America: enter, the United States-Mexico-Canada Agreement (USMCA). The three countries are expected to sign the renegotiated deal by the end of November 2018. But in the midsts of tariff wars, questions still remain about what the USMCA will mean for Canadians and how it’s different than its predecessor, NAFTA. To understand the extent of the new trade deal, the Fulcrum sat down with Anthony VanDuzer, an international trade professor at the University of Ontario. The Fulcrum: Can you explain how the USMCA came to be? VanDuzer: The USMCA is essentially a replacement for NAFTA, which Canada, the U.S., and Mexico negotiated in the early 1990s. It was the first comprehensive trade agreement in North America. NAFTA was really about establishing free trade within North America. It wasn’t perfect, it didn’t eliminate all barriers to trade, but it substantially created free trade amongst the three countries. This facilitated business across international borders and encouraged businesses to come to North America. President Trump was concerned that the interests of the United States were not well-served by NAFTA. In particular, I think he was concerned that it had encouraged U.S. businesses to invest in Mexico, meaning manufacturing capacity in the U.S. moved to Mexico which meant of course fewer jobs for American workers. When he arrived in the president’s office he talked about the possibility of just terminating NAFTA, which you can do with six months’ notice. What ultimately happened was an agreement between the three after party states renegotiated the treaty, which took a little more than a year. They started in summer of 2017 and came up with this agreement that was signed by the three governments on Sept. 30. F: Which industries do you think will be most affected by it? V: There’s been a lot of publicity related to the impact on the dairy industry in Canada, which is regulated through a supply management system that controls the domestic supply of dairy products. This tries to ensure that there is supply that is available. It also ensures that farmers have a market for their products and in order to make that work, you have to restrict dairy products coming into the country. Trump was particularly concerned about supply management. At the same time, dairy farmers, particularly in Ontario and Quebec, want this system to be maintained because if we abandon it, they feel they would be very negatively affected by a flood of cheap U.S. dairy products coming into Canada. We agreed to a very limited amount of U.S. dairy products coming into Canada, about 3.5 per cent of the market. It’s also only a half a percent or so more than the U.S. would have got if they’d stayed in the Trans-Pacific Partnership agreement, which they withdrew from when Trump was elected. So overall it’s not a huge concession, but it is undoubtedly going to have an impact on dairy farmers. The federal government has indicated that they will provide compensation to the dairy farmers for any injury that they suffer as a result of increased competition because we’ve opened up the market. Most of the other industries I think are not going to be affected in a very dramatic way, in large part because most of what’s in the USMCA was already in NAFTA. One of the things we agreed to was to data protection for a type of pharmaceutical drugs called biologics (one of the most expensive type of drugs on the market, used to treat cancers and multiple sclerosis). Under the USMCA, the minimum data protection period in Canada went up from eight years to 10 and in the U.S. it’s 12. It would allow manufacturers to limit competition for those additional two years of time in a way they wouldn’t otherwise, and that could have an impact of increasing drug prices for Canadians. It’s a little hard to know exactly what that’s going to look like. Some estimates have said that it might be hundreds of millions of dollars. F: Do you think that the situation in general is fair, or has the U.S. strong-armed Canada and Mexico into redoing NAFTA? V: Neither Canada nor Mexico had a particular interest in renegotiating NAFTA, although there was some interest in updating it. It was clearly the Americans that had a concern. I don’t think Canada overall is going to be significantly worse off and one of the challenges for Mexico I think in the agreement which could have an impact on them certainly is the rules that were agreed to with respect to the auto sector minimum wage. There is now a rule which says that between 40 to 45 per cent of auto production has to be in countries that have a wage for auto workers that is at least $16 U.S. an hour. It’s possible that in order to conform to that requirement that the North American automakers will shift some production either to the U.S. or Canada and out of Mexico. But it’s hard to predict that really at this stage. F: Canada insisted that keeping Chapter 19 (dispute resolution) was a big win. How vital do you think it was to keep that clause? Well I think it’s a useful device for Canada, but it probably wasn’t essential. There are actually a whole lot of different dispute resolution procedures in the agreement and Chapter 19 actually has a fairly narrow focus. 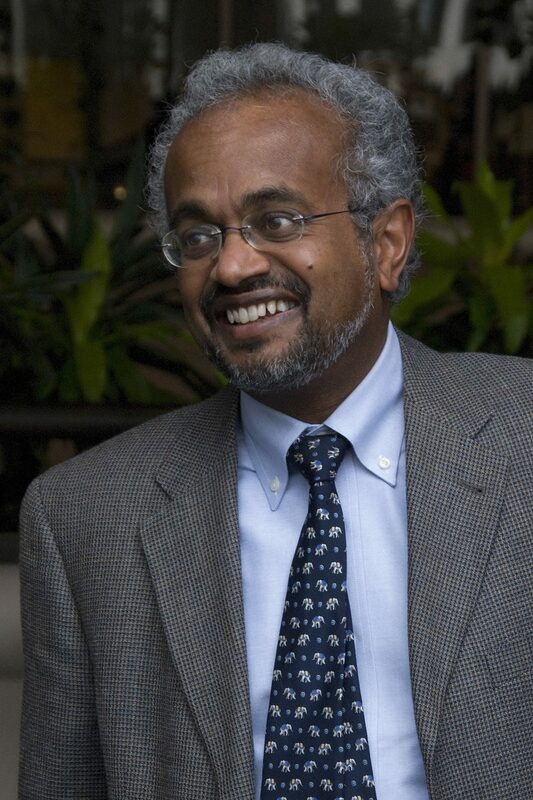 It’s only on domestic decisions related to what lawyers call trade remedies, which are decisions about whether goods are being dumped into the country by exporters from outside the country or whether exporters are benefiting from domestic subsidies in the countries in which they operate and then are selling those subsidized goods into the other country. What Chapter 19 does is essentially it replaces domestic court review with review by a system of binational panels. Members of the panels are appointed from rosters which have been established by each country. It was designed to ensure that the system operates in each country in accordance with its own rules to avoid bias. But domestic court review is supposed to establish the same thing, so it’s redundant in this sense. I was a little bit surprised that the Canadian government felt that this was the issue that they were going to go to the mat on as compared to all the other things that were concerns. F: Trump has expressed distaste for Prime Minister Justin Trudeau on numerous occasions. Do you think the outcome of the negotiations would have been different if either party had different leadership? V: I think the starting point probably is that if President Trump hadn’t been elected, we would never have had a renegotiation in the first place. Hillary Clinton did express some concerns about NAFTA but she might have initiated some kind of a broad-based renegotiation. President Trump and some of his advisors were highly skeptical about free trade agreements and their value. Their initial concern was Mexico and then Canada was brought in, I think as a bit of an afterthought. The Trump administration adopted a variety of tactics which are quite unusual and extraordinarily aggressive in the negotiations. The personal dislike that was expressed by the president, that kind of thing is not normally part of international discourse. I think that had undoubtedly impaired the effectiveness of the negotiations because the two governments seem to have this mutual dislike. That was undoubtedly a complicating factor and it didn’t help in getting to a resolution. But the USMCA worked out I think in large part because the Canadian government and its representatives, including Prime Minister Trudeau and Foreign Affairs Minister Chrystia Freeland, didn’t stoop to that level in their own discourse and continue to work hard and in a responsible way to achieve an agreement. They’ve salvaged most of the benefits that were available under the original NAFTA. One thing I would mention that is really quite extraordinary is Trump’s move to impose tariffs on steel and aluminum and his justification was national security. That was important because under U.S. domestic law, the president does not have authority to just sort of change the tariff rules but he does have the authority under Section 232 to impose tariffs to ensure the protection of national security. Now there is no doubt in anyone’s mind that the real goal of the president was not to protect national security but rather to get leverage in the negotiation for the treaty. And in fact there are statements by the U.S. administration to that effect. F: Do you think Canada negotiated a good, fair deal? If not, what could they have done differently and what should they have pushed for more? I’m not sure that they could have done much differently given the position that the Americans had taken. Not only were they very aggressive, but they lowered the level of discourse to this personal criticism of the leaders of the negotiations on the Canadian side. They also simply weren’t prepared to really negotiate. I mean I think that the position that the Americans tended to take was that this is what we want. And you either accept that or you go away. And of course it didn’t help that from the Canadian perspective that Mexico had agreed independently to a set of commitments which Trump was prepared to take forward to Congress either with or without Canada. There wasn’t a lot of room for Canada I don’t think to negotiate a better sort of a deal, and as I’ve said, (given) the circumstances I think the outcome is a pretty good one. Not much changed. F: How will the Canadian public be impacted? With respect to the dairy industry, the people who are going to experience the hit are the dairy farmers. While they are very well organized politically and they’re an important group of people, they’re relatively small in number. So it’s not going to be consumers that are going to be experiencing the hit. It’s important to bear in mind that I mean 90 per cent of the market is still protected so it’s not like it’s open season in dairy. One other real concern for some members of the public and some NGOs is the new agreement essentially phases out investor state arbitration for disputes between Canada and the U.S.: that is, U.S. investors complaints against the Canadian government and vice-versa. Under NAFTA, Americans were frequently bringing complaints against Canada and there were plus or minus 35 complaints that had been filed and some of them have led to damage awards or settlements totalling a little over $200 million. That’s no longer going to be possible. So that kind of flashpoint for public concern between Canada and the U.S. at least is going to disappear. I think that’s going to make this agreement easier for some constituencies to accept. F: Trump has taken a nationalistic approach to politics, where it’s about putting America first. Do you think this type of negotiation is going to have an impact internationally? Are we going to start seeing more countries negotiating in similar ways with similar agreements? I think part of the answer is that the U.S. is unique. They’re the biggest economy in the world so they have more flexibility/freedom to adopt these kinds of aggressive positions, whereas other countries don’t. Even if you had someone who wanted to adopt a similar approach to negotiations, they simply don’t have the economic clout to do that. Now there are some exceptions to that. It’s possible I suppose, at least looking at economic power of the European Union (EU) or China, but I don’t see it happening in the EU as they’re firmly committed to the international system and they’ve repeatedly endorsed it. China is a little bit unclear. I would say that China is now looking to develop the international system rather than trying to do what the U.S. is doing, which is essentially to try to not only focus on U.S. interests but to focus on developing the internal economy in isolation from the global economy. China’s not doing that. Characterizing the American position as nationalism is a reasonable characterization and certainly we’re seeing the development of more stridently nationalist governments and a lot of other places including some European countries especially in Eastern Europe. It’s possible that we may see more aggressive negotiations in that way where negotiations are dominated by countries’ strong perceptions of their own selfish national interests. There could be some sort of overall transformative effect, but I think that you can’t disregard the fact that the U.S. is the most powerful country in the world and the flexibility they have to engage in this kind of negotiating behavior is simply not available to other countries in those contexts. Farm economies in the United States, Mexico and Canada are very different than they were when the North American Free Trade Agreement (NAFTA) was signed. Supply chains for meat and feed have become highly integrated, with goods and animals flowing back and forth across borders to take advantage of the cheapest conditions, allowing for dramatically increased corporate concentration. After NAFTA, Mexican farmers were devastated by the flood of cheap corn from the U.S. Nearly two million Mexican farmers were driven out of agriculture, with many more losing their farms to become contract workers or compelled to migrate to cities or to the U.S. to seek work.1 More than 250,000 U.S. small—and medium-scale family farms have disappeared since NAFTA,2 as volatile prices and increasing corporate concentration and control made it harder for them to make a living from the land. Farm Bill programs enacted since NAFTA have facilitated farm consolidation and a deeper reliance on export markets to absorb chronic over-production and low prices. Also, since NAFTA, our food systems have become less healthy, with increasing meat and processed food consumption contributing to rising obesity in all three countries, but especially in the United States and Mexico. Consumers and farmers are pushing back, leading to more demand for healthier and locally grown foods and for farm and trade policies that are fair and sustainable. Unfortunately, the new NAFTA, dubbed the U.S.-Mexico-Canada Agreement (USMCA), not only doesn’t fix the problems in the original agreement, it takes several steps back from those goals. Canada’s existing dairy supply management program has been weakened, a promising new initiative in Mexico to enhance food sovereignty is endangered and the problem of dumping of agricultural exports has been ignored. Canada’s supply management program has been operating for more than 40 years, long before the current crisis in U.S. dairy markets. The U.S. crisis is due to massive oversupply linked to the growth of mega-sized dairy operations and years of prices below the true cost to farmers. Most Canadian dairy farms are family owned and operated, and this program helps them stay in business without reliance on public subsidies. This program of balancing Canadian supply and demand requires the ability to restrict imports, so they don’t overwhelm the market. Canada’s dairy program was excluded from the original NAFTA. Recent increases in consumer demand for butter have reduced the market for high-protein milk products. Over the last few years, U.S. dairy processors have exported ultrafiltered milk or diafiltered milk as a concentrated protein product under customs definitions (thus avoiding Canadian dairy tariffs) for use in cheese and other food production. As the market for these inputs rebalanced, the Canadian Dairy Commission decided to create new designations for dairy products (Class 6 and Class 7) for ingredients like protein concentrates, skim milk and whole milk powder. The decision to lower the price of Class 7 products as supplies built up led to trade tensions with the U.S.
New NAFTA creates a special window, called a tariff rate quota, for duty-free exports of U.S. dairy products to Canada amounting to 3.6 percent of the Canadian market. This comes on top of a concession equivalent to 3.25 percent of the market granted under the Comprehensive and Progressive Agreement for Trans-Pacific Partnership (CPTPP), and additional market access for 17,500 tons of European cheese under CETA (the Canada-European Union trade deal). While the Canadian government has promised farmers some compensation for the opening, National Farmers Union Canada president Jan Slomp says, “We take no comfort in promises of compensation…CETA shrinks total revenue available to Canadian farmers, yet the subsidy is given to the farmer that expands. To expand when revenue is diminished is a rather reckless business decision.”3This approach will contribute to overproduction in Canada, replicating the problem at the heart of the U.S. dairy crisis. These kinds of programs would require significant restructuring of Mexico’s support to agriculture, which could be undermined by language in the Agriculture Chapter of new NAFTA. Article 3.6.1 states that, “If a Party supports its agricultural producers, the Party shall consider domestic support measures that have minimal or no trade distorting or production effects.” While “shall consider” is not binding language, it is consistent with other provisions, especially the articles that follow, which establish a consultation process in cases where trade distortion is alleged. It seems possible that the López Obrador administration’s plans to reorient agriculture spending to achieve self-sufficiency in corn, beans, wheat and rice production and to end reliance on imports of those goods through floor prices, public procurement, and production and distribution of fertilizers7 could be considered trade distorting. The more important question is not whether these programs distort trade, but if they contribute to enhanced rural livelihoods and food security. In addition, Article 20.A.7 (2) of new NAFTA, like the CPTPP, requires all countries to ratify the 1991 version of the International Union for the Protection of New Varieties of Plants (UPOV 1991), which prohibits farmers from saving and sharing protected seeds. Mexico ratified the 1978 version of that accord, which includes exceptions for small-scale farmers, but has declined to ratify the more stringent 1991 version. Given the recent experience of Guatemala and other Central American countries after ratification of the U.S-Central America-Dominican Republic Free Trade Agreement,8 it seems likely that the U.S. would insist that Mexico comply with that new requirement as well. Changes to this losing game would require reforms to both farm and trade rules. For example, NFFC and the U.S. National Farmers Union, among others, have suggested that rather than weakening Canada’s dairy supply management program, the U.S. should consider adopting a similar program to revitalize U.S. dairy markets. Those groups, along with many others including the ranchers organization R-CALF and the United Food and Commercial Workers Union (as well as IATP and Food & Water Watch) asked for Canada and Mexico to withdraw their WTO complaint against mandatory Country of Origin Labeling (COOL) for meat. Congress overturned COOL after the WTO found that the labeling program restrained trade, but without the complaint it could be refined and restarted so that consumers could know where their meat is grown and processed. That proposal is not addressed in new NAFTA. The Trump administration has proclaimed U.S. farmers “winners” under USMCA, but the main achievements they claim are holding on to the status quo on most tariffs and increased market access to Canadian dairy markets—neither of which will contribute in any meaningful way to resolving the problems of U.S. farmers. Many of the supposed fixes in new NAFTA are provisions brought in from the rejected CPTPP. Agribusiness exporters may be breathing a sigh of relief that they can continue with business as usual, but for rural communities confronting falling incomes, rising debt and an increasingly unstable climate, new NAFTA is a lost opportunity for change.